The 163-acre park in the heart of Washington, D.C., is home to approximately 4,000 animals representing nearly 400 species. 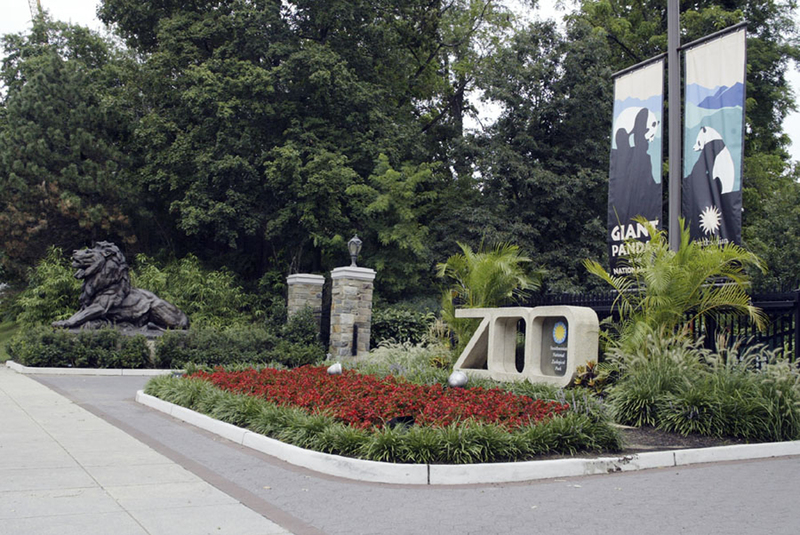 Almost a quarter of the animals at the National Zoo are endangered species, including, Asian elephants, North Island brown kiwis and western lowland gorillas. The Smithsonian Conservation Biology Institute serves as an umbrella for the National Zoo’s global effort to understand and conserve species and train future generations of conservationists. Headquartered in Front Royal, Va., SCBI facilitates and promotes research programs based at Front Royal, the Zoo in Washington, and at field research stations and training sites worldwide. Asia Trail and the David M. Rubenstein Family Giant Panda Habitat—Asia Trail is home to the giant pandas and five other species: sloth bears, clouded leopards, fishing cats, Asian small-clawed otters and red pandas. A bridge from the Asia Trail provides a scenic overlook of Elephant Trails. The Zoo’s giant pandas—Mei Xiang, Tian Tian and Bei Bei—live in the David M. Rubenstein Family Giant Panda Habitat. Cheetah Conservation Station—The Zoo currently has three adult cheetahs and a separate cheetah breeding center in Front Royal. The Cheetah Conservation Station is also home to Grevy’s zebras, dama gazelles, scimitar-horned oryx, maned wolves, Ruppell’s griffon vultures, sitatunga, Abbyssian ground hornbills and red river hogs. Elephant Trails—The Asian elephant habitat includes four elements: a new elephant barn, four new outdoor yards, the Elephant Exercise Trek and The Homer and Martha Gudelsky Elephant Outpost. It also includes a state-of-the-art Elephant Community Center where elephants can socialize, play and participate in training. Currently, there are seven Asian elephants that live at Elephant Trails: Ambika, the second oldest Asian elephant in a North American Association of Zoos and Aquariums’ accredited zoo, Shanthi, Bozie, Kamala, Swarna, Maharani (Kamala’s daughter) and Spike. Bird House—Please note: The Bird House is currently closed for renovation. Experience Migration, a first-of-its-kind attraction that will immerse visitors in the annual journeys of western hemisphere birds, is expected to open in 2021. Small Mammal House—Most of the species in the Zoo’s Small Mammal House are no bigger than a breadbox. Visitors can gaze at the sprightly grace of golden lion tamarins, the expansive ears of the fennec fox, the uncanny armor of the three-banded armadillo and the fascinating quills of the prehensile-tailed porcupine. groundbreaking exhibit exploring animal cognition. In April 2018, the Zoo welcomed a male western lowland gorilla—Moke—to the Great Ape House. Moke represents the eighth successful gorilla birth for the Zoo since 1991. Reptile Discovery Center—Home to a diverse collection of cold-blooded animals, ranging from the Cuban crocodile, hellbender and Timor python to the giant Aldabra tortoise and needle-nosed gharials, the Reptile Discovery Center is filled with some of the world’s most exciting reptiles and amphibians. Visitors can view the Zoo’s Komodo dragons in their open-air enclosure. Great Cats—Sitting atop Lion-Tiger Hill, the Great Cats has one Amur tiger, a male named Pavel, and one Sumatran tiger, a female named Damai. Damai gave birth to a male Sumatran tiger cub July 11, 2017. The cub was later transported to the San Diego Zoo Safari Park, where he currently lives and thrives with another young male tiger cub. American Trail—American Trail is home to five California sea lions, four gray seals, and one harbor seal. It also features bald eagles, beavers, wolves and river otters—animals found in North America. Amazonia—The Zoo’s Amazonia exhibit leads visitors into the realm of the Amazon River Basin, where giant arapaima, pacu, red-tailed catfish, turtles and stingrays swim underwater, and sunbitterns, roseate spoonbill and dusky titi monkeys, and a inhabit the world above. More than 350 species of plants including kapok, avocado and cocoa trees; tropical vines; and epiphytes live in this enclosed tropical habitat. The Amazonia Science Gallery showcases biodiversity and the work of Smithsonian scientists. It features a nutrition laboratory, a coral science lab, wildlife toxicology exhibits and a section featuring amphibians under the threat of extinction. Kids’ Farm—While enjoying hands-on features at this exhibit, children learn about the time, dedication and knowledge necessary to care for animals. Under close staff supervision, children can help groom the cows, donkeys and goats at the Caring Corral. The Zoo was one of the first zoos to establish a scientific research program. Today, its scientists conduct research to aid in the survival or recovery of species and their habitats to ensure the health and well-being of animals in captivity and in the wild. Conservation biology is a relatively young science that uses interdisciplinary approaches to address the challenges of maintaining biological diversity. Zoo scientists are based in Washington, D.C., SCBI headquarters in Front Royal, Va., and at field sites around the world. During the past 30 years, more than 4,300 people from 109 countries have been trained through the Zoo’s professional conservation and zoological medicine training programs. SCBI is also a partner with George Mason University in a collaborative semester-long program for undergraduate students focusing on conservation biology. Many animals at the National Zoo are part of conservation efforts managed by Species Survival Plans. Through the AZA’s SSPs, zoos match and exchange animals for breeding, fostering scientific research and reintroducing animals—such as black-footed ferrets, and Guam rails—back into the wild. The Zoo directs several SSP programs, including, kiwi, maned wolves, Eld’s deer and cheetahs. In addition, SCBI is a key player in a number of global conservation partnerships, including the Panama Amphibian Rescue and Conservation Project and the Global Tiger Initiative. The Panama Amphibian Rescue and Conservation Project aims to rescue amphibian species that are in extreme danger of extinction throughout Panama as the result of the deadly fungus chytrid. The project’s efforts are focused on establishing assurance colonies and developing methodologies to reduce the impact of chytrid so that one day captive amphibians may be re-introduced to the wild. As part of the Global Tiger Initiative, a joint project with the World Bank, tiger-range countries and other organizations, SCBI provides tiger conservation training for policymakers and conservationists in tiger-range countries. The Global Tiger Initiative aims to double the number of wild tigers by 2022—the next year of the tiger. SCBI participates as a candidate core site for the National Ecological Observatory Network, a planned continental-scale ecological observatory. This national observatory will consist of fixed and mobile sensors located in 20 wild areas across the continental United States, as well as in Alaska, Hawaii and Puerto Rico. NEON is a project of the National Science Foundation. Drawing upon the latest research of scientists at the Zoo and around the world, the National Zoo offers a broad array of classes, workshops, courses, curricula materials, summer camps, lectures and themed events for adults and children. The Smithsonian-Mason School of Conservation, which has a campus at the Smithsonian Conservation Biology Institute in Front Royal, Va., offers undergraduate and graduate courses. Friends of the National Zoo (FONZ) is a nonprofit organization also dedicated to the conservation, education, and science mission of the Smithsonian’s National Zoo. Since 1958, FONZ has supported the Zoo by developing and implementing education, membership, and volunteer programs, hosting special events, raising funds for Zoo projects, and by providing grants for Zoo research, and concessions, merchandise and other services to Zoo visitors. Steven Montfort is the director of the Zoo. There are approximately 400 employees working at the Zoo’s Rock Creek and Front Royal campuses in the areas of animal care, science, technology, communications, park management, facilities, law enforcement and administration. More than 100 facilities maintenance employees work at the Zoo as well. Visit the National Zoo online at http://nationalzoo.si.edu, and on Facebook, Twitter and Instagram.